EAST LANSING — Aaron Stephens, a senior at Michigan State University, says he’s still not sure why a newly formed Super PAC spent $32,823 to support his city council campaign this fall. But it happened. The spending by the Greater Lansing Association of Realtors PAC, which blanketed East Lansing with pro-Stephens mailers before the Nov. 7 election, tripled the combined spending of the three candidates in the race. Stephens ended up narrowly winning one of the two seats up for election on the East Lansing City Council, coming in second place by 336 votes over an incumbent who finished third. The candidates in the race believe Stephens, an energetic young Democrat, would have won without the Super PAC’s help. However, an official with the PAC believes the PAC’s spending actually made the difference for Stephens. The situation in East Lansing — a city of 48,870 people — is another example of the growing role of independent spenders in Michigan elections of all sizes. These Super PACs can raise unlimited amounts of money from individuals and corporations and can spend unlimited amounts of money, as long as they do it independently of the candidates’ campaigns. Super PACs can quickly boost the profile of a candidate. They can also spur intrigue about who’s behind the money and how that group’s interest connects to the candidate. In addition, Super PAC involvement can explode the cost of campaigns. All three of these possibilities played out in East Lansing this fall, which could be a signal of what's to come. Super PACs figure to be major players in the 2018 statewide elections, in which Michigan voters will choose a new governor, a new attorney general and a new secretary of state. Supporters of one candidate for governor have already formed a Super PAC to boost the candidate's chances. That news came after Gov. Rick Snyder signed a bill in September that gave Super PACs a place in state law. The new law allows candidates to raise money for Super PACs and allows candidates’ campaigns and Super PACs to share certain consultants. The Greater Lansing Association of Realtors PAC formed on Oct. 4, 2017, about a month before the election. It went on to spend $32,823, supporting Stephens through digital advertisements and mailings, according to a campaign finance filing. Stephens’ own campaign reported spending $7,288, which dwarfed the spending of the two incumbents in the race. The campaign of Ruth Beier, an economist with the Michigan Education Association, spent $2,256, according to her campaign's disclosure. Beier finished in first place. The campaign of Susan Woods, the founder of the East Lansing Film Festival, spent $958, meaning for every $1 she spent, pro-Stephens forces — his campaign and the Super PAC — spent about $40. 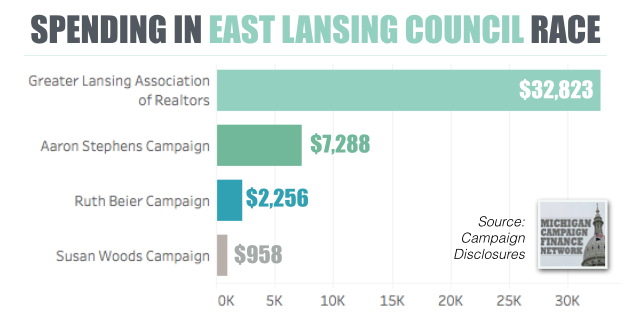 Combined, according to the campaign finance disclosures, the three candidates’ campaigns spent $10,502, a third of what the Greater Lansing Association of Realtors spent. The association PAC spent $5.31 on average for each person who voted in the city council election. Woods said she’s never heard of such an expensive race for East Lansing City Council. And like Stephens, Woods isn’t sure why the Greater Lansing Association of Realtors PAC spent so much money on the race. But Woods, like many others in East Lansing, has theories. One of the potential theories is the PAC’s support for Stephens was connected to the East Lansing City Council’s push for a new income tax to fund city operations. Along with the city council race on Nov. 7, voters were also asked to approve a 1.0 percent income tax for city residents and 0.5 percent income tax for non-residents who work in East Lansing. The Greater Lansing Association of Realtors and the leadership of Michigan State University, located in East Lansing, opposed the income tax proposal, which failed. Although Stephens himself supported the proposal, some in East Lansing believe the association’s backing of Stephens could have been connected to the council’s pursuit of the income tax. However, Mark Dickens, vice president of public policy and operations for the Greater Lansing Association of Realtors, said the group’s decision to back Stephens wasn’t because of any one issue. Dickens described an overall frustration with the council. “We just want to be able to work with the city of East Lansing,” he said in an interview. For one example of the association's frustration, Dickens said the association, which has more than 1,000 members, had reached out to East Lansing city leadership about the high cost of installing Radon mitigation systems in homes in East Lansing. The cost for installing such a system in East Lansing is about double what it costs in other cities, Dickens said. Dickens said the association attempted to interview the three candidates in the East Lansing race. Beier didn’t attend an in-person interview but submitted a written survey response, he said, while Stephens and Woods participated in in-person interviews. Dickens called Stephens a “fresh voice.” He was the lone candidate the association endorsed in the race. “We like his plan for unity and growth for East Lansing and bridging the gap between the city, university, business community and neighborhoods,” Dickens said. The investment in the 2017 council race was the largest investment the association has made in a local race, Dickens said. According to campaign finance disclosures, the money for the PAC came from the National Association of Realtors, based in Chicago, which describes itself as the nation’s largest trade association. Jon Boughtin, public issues media manager for the national group, said local and state realtors associations can request funds to be spent in local races. It’s up to the local groups to identify the candidates they want to support, he said. Stephens said he didn’t ask the local organization to spend the money, had no control over it and didn’t even know about the spending until a local reporter asked him about it. The other candidates in the race, Beier and Woods, also credited Stephens’ door knocking. Dickens, however, believes the association’s spending helped. 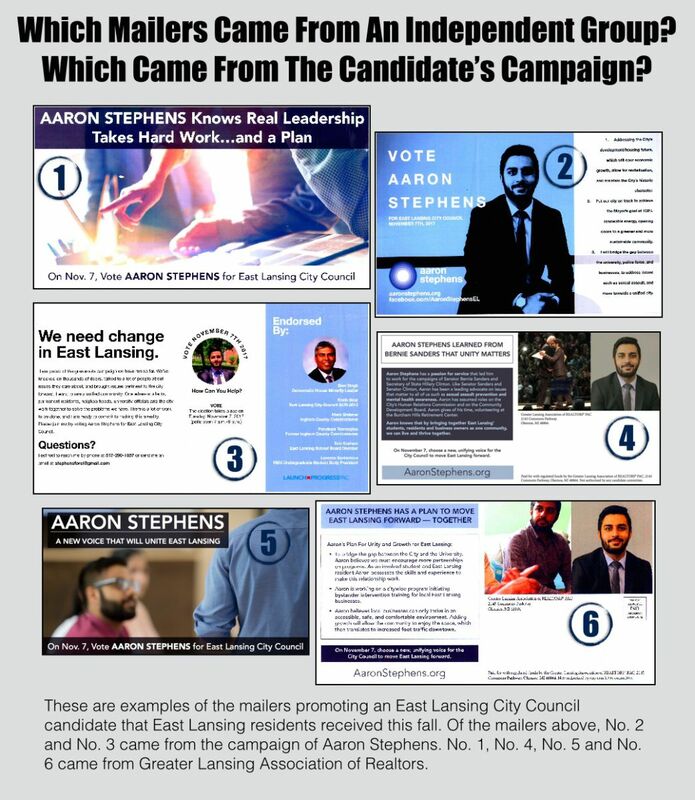 While Stephens knocked many more doors than his opponents, the mailers provided additional positive information for East Lansing residents about Stephens. 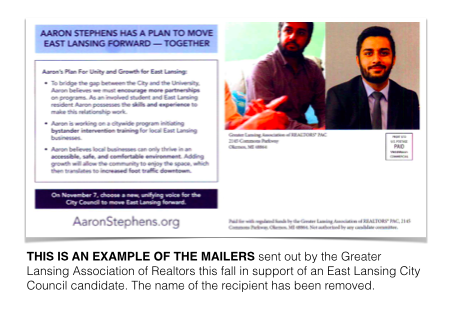 The PAC funded three mailers, each stressing Stephens’ desire for unity between East Lansing and Michigan State University. The mailers often used similar language to the language on Stephens’ campaign website. One mailer, which was posted online, featured a photo of Stephens with 2016 Democratic presidential candidate Bernie Sanders. Stephens served as a volunteer organizer for the Sanders campaign. The mailers went out citywide, Dickens said. “I don’t think he would have won without our support,” Dickens said. He also noted that the association intends to be involved in additional races in the future. That’s something Beier predicts. She said if the realtors and the local chamber of commerce believe they won the race for Stephens, they’ll be back in the future to support other candidates. “This will not be good for East Lansing,” she argued. “But, I have faith in our voters. I think Aaron (Stephens) won because he worked much harder than did Susan (Woods). My guess is that he spoke to most of the people who ended up voting for him. The East Lansing City Council race wasn’t the only city council race that drew the involvement of a Super PAC. For one example, in Detroit, a Super PAC called Detroit Community Impact Committee sent out mailers against Raquel Castaneda Lopez, the council member for the 6th District in the southwest Detroit who won re-election despite the negative mailers. The Super PAC reported spending $60,402 this fall. Its money came from two corporate entities connected to the Moroun family. The corporate entities were the Detroit International Bridge and Central Transport. Castaneda Lopez’s campaign raised $79,285 for the election cycle. Her opponent, Tyrone Carter, who worked for the Wayne County Sheriff’s Department for about 25 years, raised $106,824 for his campaign. Carter said in the run-up to the election that he didn’t know anything about the Super PAC’s involvement. Super PAC spending can be difficult to track at the local level in Michigan because if the Super PAC is active in only municipal or county-level races in one county it can file its campaign finance reports with the county clerk. Few county clerks have searchable disclosure systems that make it easy to track independent expenditures. Residents often need to know the Super PAC’s name in order to find its disclosures. At the state level, the Michigan Secretary of State provides a tool to search all independent expenditures reported within a certain timeframe.